RackForms is more than just forms and surveys, with builder it's a complete application building And Reporting solution. So what is Builder? Builder is a standard feature of RackForms for creating forms that display data in a beautiful grid layout. For example, we can show all players who've signed up for a baseball team, available scholarship applications, medications available at a particular clinic location, and so on. Such pages are often combined with larger jobs to create full applications. 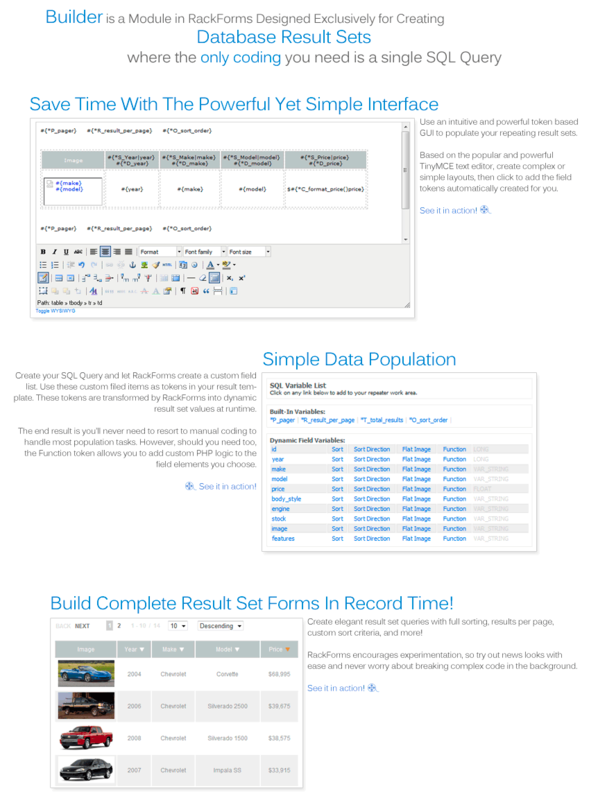 RackForms is already the most advanced web form builder, with Builder you'll smash the barrier between simple data collection and building full featured applications — no other form application has this feature. Builder is yet another one of our time-saving features developers absolutely love!